People in the East Texas town of Carthage know Bernie Tiede as perhaps the nicest man around. A plump, mustachioed mortician’s assistant, he pays considerable attention to the bereaved, offering no end of concern, particularly to those old widows who seem to appreciate his kind of care so much. In the community, Bernie actively participates in town religious and artistic activities; he sings (beautifully) in the church choir, and he performs in and directs musicals at the community theater. He’s polite, charming, thoughtful, well-groomed, and has a practiced diction. Even though his ambiguous sexual orientation may be suspect among many of the townsfolk, Bernie’s effeminate mannerisms and finer cultural awareness don’t seem to affect his congenial standing. Everyone in Carthage thinks he’s just the bee’s knees. And so, who would ever think a man like this would be at the center of Bernie, a true-crime tale from director Richard Linklater? 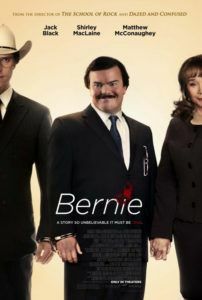 In the mid-1990s, Bernie (Jack Black) befriended local octogenarian Margie Nugent (Shirley MacLaine), the widow of a former oilman. Unlike Bernie, Margie s universally detested among both Cathage’s populous and her own family. She’s a strong-headed, malicious woman living on an estate filled with stuffed kills from her late husband’s safaris. Feeling sorry for her, Bernie makes it his mission to become Margie’s friend through acts of kindness. A few deliveries of flowers, chocolates, and bath products later, and Margie finally invites Bernie in and they quickly form a bond. They dine, see shows, and take expensive vacations together, much to the curiosity of Margie’s inheritance-minded family, not to mention the townsfolk who whisper about their rumored May-December romance. Bernie eventually moves in and gains access to her money, while Margie grows more possessive and jealous of Bernie’s time. She insults him and savors her control over him, and one day Bernie—this pinnacle of both Christian and small-town values—snaps and shoots Margie four times in the back. In a panic, Bernie stuffs her body into the freezer, where she stays for several months as he makes his apologies for Margie’s absence to her accountant and family, all the while spending her money not on himself, but on community programs and charities. Inspired by Skip Hollandsworth’s 1998 article on the crime, Linklater worked closely with Hollandsworth to complete the script. 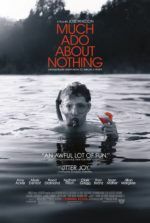 The director uses a docudrama format by combining real-life testimonials from onscreen Carthaginians and blending it with dark comedy dramatization. Amusingly, as details of the case emerge, the town is so unwavering in its support of Bernie and its disdain for Margie that district attorney Danny Buck Davidson (Matthew McConaughey) feels he must move the case to the next county to ensure a fair trial—which is to say, fair in that Bernie’s case will be met by a jury not already convinced of the defendant’s innocence. In spite of the full, teary confession Bernie makes after he’s arrested, many of Carthage’s residents refuse to believe he did it. Even those who do acknowledge Bernie’s confession are steadfast in their belief that he should be freed. Meanwhile, McConaughey gives another in his trifecta of great 2012 performances (along with Magic Mike and Killer Joe) as the baffled, go-get-em do-gooder D.A. who loves the spotlight, and who none-too-subtly attacks Bernie’s assumed homosexuality. Black gives his finest performance yet, employing a nuanced description of a prim and proper man, his mannered gestures and walk carefully considered, but also riotously funny. For the first time since Peter Jackson’s King Kong, Black disappears into his role, unlike his last collaboration with Linklater, the ultimate ‘Jack Black movie’ School of Rock. And yet, Black performs all his signature talents—he sings, dances, and performs comedy in a film that, although black as pitch, has no end of laughs for audiences drawn to such unconventional material. 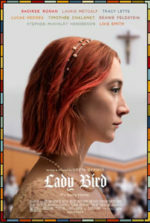 Linklater’s focus is evenly distributed between Black’s perfect performance and those of his supporting cast in their testimonials, some made by unknown actors, others by actual residents looking straight into the camera. Like a great documentarian-observer, Linklater just stands back and lets the camera roll as they mask their moral dismissal of Bernie’s act through their candid Southern perspective. Along the way, Bernie stumbles upon fascinating questions: Some concern this intriguing and divisive case, some the delicate nature of small-town mentalities, while others subside under the surface and subtly address the effectiveness of the jury system. Linklater doesn’t push the story too heavily one way or the other; and while traditionally that might open the film up to criticism for not having enough focus, his treatment is nonetheless absorbing and his unobtrusive technical approach easy to fall into. The prevailing element is our pure fascination with these townspeople and their debatably misplaced readiness to accept that “Bernie the murderer” should go free, in part because Bernie was such a nice guy, but also because Margie was so downright mean. And Linklater is as fascinated as we are. He never portrays them as backwards rednecks, and he finds an unlikely spring of sympathy and hilarity in a man who shot an 81-year-old widow four times in the back. Filmed and considered with integrity toward a subject that could have easily devolved into a mockery, Linklater’s film is one of the best comedies and most interesting films of the year.